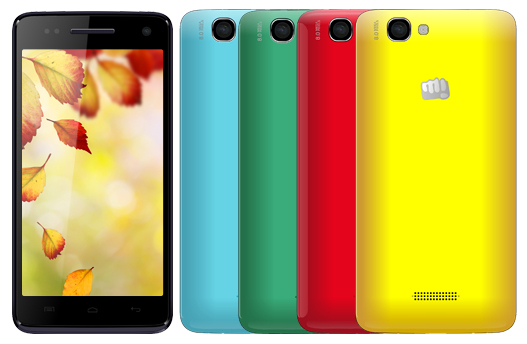 Micromax Canvas 2 Colors A120 the company’s latest smartphone has been officially launched. The Micromax A120 Canvas2 Colours comes with 5 inch 720p HD display and draws the strength from 1.3 GHz 4-core CPU accomplished with 1 GIGS of RAM. The Features are quite stunning at this price. The Canvas2 Colors A 120 is a Dual SIM phone and features a 8-megapixel primary shooter. It will compete with ( VS) Gionee Pioneer P4 and Lava Iris 450. The A-120 has 4 gigs on internal storage and up to 32GB expandable storage via micro SD card. There is 2000 mAh battery to power the device, which claims 7 hours & 45 min of talk time. It offers 3G, WiFi, Bluetooth, GPS and Micro USB connectivity. The Micromax A120 Canvas2 Colors would be priced under RS12,000. Although the final pricing of the phone is not known yet. Check out more on Micromax’s Official website.